Description: Today’s Oil and Gas industry is under intense pressure and scrutiny from regulators, shareholders and communities demanding safer and cleaner operations with less environmental impact. 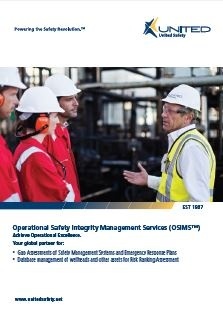 Operational Safety Integrity Management Services – OSIMS™ is a proprietary model developed by United Safety to help customers achieve their goal of Operational Excellence. This brochure provides a glimpse of the services we offer under OSIMS™ that allows Oil and Gas leaders to confidently prove they are running their assets safely, reliably, and sustainably and cost effectively.